Sclerotherapy is a medical procedure used to eliminate varicose veins and spider veins, usually in legs. You can expect an improvement of approximately 80% in treated vessels. The number of sessions required depends upon the severity of the problem. A better assessment can be given during your complimentary consultation. 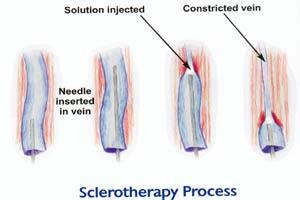 Call us at 1-888-332-9930 OR request a consultation online to get more information about Sclerotherapy and get started with one of our Registered Nurses. Laser Aesthetics provides professional, 100% medically safe Sclerotherapy service to our clients in all areas surrounding Burlington and Hamilton.